A VPN is a crucial component for safe and anonymous browsing online. 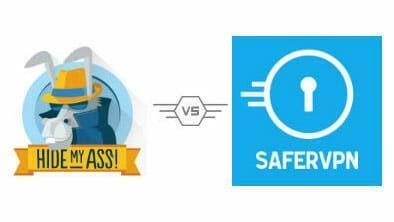 Today we look at two top providers, HideMyAss and SaferVPN, to determine which comes out ahead. Read on to see how they stack up! More people today are taking the necessary steps to ensure the safety of their personal information and identities. VPNs offer an easy solution to browse anonymously and securely, while still having access to geo-restricted online content and the best streaming services. However, with such a crowded market, finding the right provider takes a deft touch. Our team of tech experts has decided to compare VPN services and find out which one should be users’ top choice. We’re examining HideMyAss and SaferVPN and going in-depth into their features. Find out who took the crown below! We base our VPN comparison on 11 key components of a good VPN service provider, including performance, pricing, security, access to streaming services, and other essential features. In addition, we consider the client experiences our users received. VPNs with more server options can offer better access to geo-restricted content and can improve general network speeds. Additionally, offering simultaneous access across multiple devices gives users better access and protection. HideMyAss has over 860 servers in nearly 200 countries, though it sets a bandwidth cap of 10GB per month. The well-known brand supports Windows, Mac, Android, and iOS devices, and clients can log through 5 devices at once. SaferVPN has more than 700 servers in 36 countries but stands out for its unlimited bandwidth. This company has apps for Windows, Mac, iOS, Android, Chrome, and routers among others. Clients can connect 5 devices with this company, as well. Available Streaming Services. By bypassing the geo-restrictions many streaming services set, VPNs are becoming a must-have service in every household. Both competitors have proven they can access US Netflix, as well as popular services like Hulu, BBC iPlayer, and more. Mobile Apps. Protecting mobile devices from unwanted attention is also important, especially with so many unsecured networks connecting to them. SaferVPN and HideMyAss each host apps for Android and iOS devices, so you can enjoy the same secure connection everywhere you go. Protocols. Encryption algorithms are the lifeline of any VPN service, securing and hiding users’ data from hackers and governments. HideMyAss works with PPTP, L2TP, and OpenVPN, whereas SaferVPN utilizes IPsec, IKEv2, and OpenVPN. Both give tech-savvy users a good opportunity to customize their privacy settings. Money Back Guarantee. If you find that a service doesn’t fit your needs, the best VPN providers issue a refund. In this case, SaferVPN and HideMyAss each provide the industry standard 30-day policy. Kill Switch. Should your secure connection stop working properly, this special function terminates it immediately, avoiding any exposure to threats. We were pleased to see both companies offer this essential tool. Speed. A VPN should be quick as it safe and not penalize users’ speed in the name of security. In this area, HideMyAss has faced regular complaints that its speeds can be unreliable and slow and SaferVPN tested impressively for speed, offering blazing fast connections near the upper end of the industry. Zero Logs Policy. This policy is designed with the intention of providing clients with as much privacy as possible, and many companies will not copy nor store your data while enjoying their service. In this case, we would recommend SaferVPN which has an explicitly 0-log policy, while HideMyAss have reportedly had issues with keeping users’ data on their servers and sharing it with officials, which could be a drawback for privacy-conscious individuals. Ensuring the safety and anonymity of the client is a top concern in our VPN service comparison. Some uphold the standard, while others create their own for better or worse. For individuals seeking customization options, SaferVPN and HideMyAss both work with a number of encryption protocols, enabling users to create the security settings they are most comfortable with. To round out their customization, each service has built-in kill switches, further protecting connections. What may trouble the more seasoned clients is the fact that both companies log users’ activities. Besides being unorthodox, customers have been voicing their complaints online. SaferVPN claims it logs a minimal amount to improve its service, but HideMyAss has reportedly handed logs over to the authorities. The brand claims to have stopped the logging recently, although this is unconfirmed. Customer support and service are two valuable aspects of any service, but here the essence of the product requires teams that are available 24 hours a day, 7 days a week. Both companies have a live chat and an e-form or ticket based email. SaferVPN is available around the clock, whereas HideMyAss is often unresponsive to refund requests. However, in our tests, both companies’ representatives answered our questions effectively and promptly. Each of the VPN service providers offers three subscription plans. SaferVPN’s rates are $9.99 for a single month, a year for $4.49 each month, or 2 years at a monthly rate of $2.49. Include with each subscription is a 30-day money-back guarantee. HideMyAss is somewhat more expensive than its rival, with a monthly plan for $11.52, 6 months for $8.33 a month, and 1 year’s subscription for $6.56 each month. To match the competition, the company also offer a 30-day refund policy. Both companies have big advantages, and though there are areas for improvement, we found that we could not pick a clear winner. Users who are seeking top speeds and customizability should check out HideMyAss. On the other hand, customers who prefer a more affordable solution with an easy-to-use interface may pick SaferVPN instead. Read more about our featured VPNs on our list, and let us know if you want us to compare any two brands! So it’s basically down to choosing between speeds and privacy? It’s a tough one, but I think I would go for SaferVPN. I used HMA for a while – or should I say about 3 days before I starting hitting my bandwidth cap. If you do anything that has high data usage, their service won’t work. I like SaferVPN. Speeds are solid and I can do pretty much anything I try. Having tried torrenting yet, but I really don’t have a need to do so – yet. This is a very well-written article and I appreciate you sharing it. I do have one question though. I was using the free HideMyA** VPN but when it stopped working, I upgraded to a paid account. However, after reading your post it seems like I may have made a mistake. Would it be better to find a different VPN, even though I started out with HideMyA**. Sorry, I’m new to this type of technology. Personally I’d go with privacy over speed and HideMyAss! seems like it’s more likely to give customers up than live up to its name. Does SaferVPN usually respond to refund requests? Is really important to me before I get a subscription thanks. Hi! In our experience, SaferVPN was very good about responding to refund requests when they were made during the initial 30-day money-back guarantee period. If your interest is in trying out the service before you make a final decision, the company was very good about responding and refunding payments during the 30 days. We hope this helps!